Located in southwest Fayette County, the Muldoon area was first settled in the 1830s. 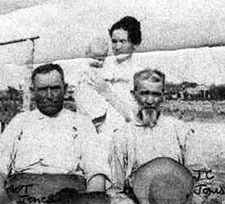 The community was named in honor of Father Miguel Muldoon and is situated on land acquired in 1831 through a Spanish land grant from Stephen F. Austin. 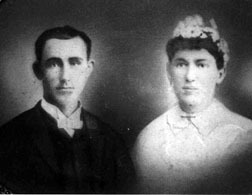 Father Muldoon was of Irish heritage, educated in Spain and moved to Mexico in 1821 when he entered the priesthood. In Mexico, he met Stephen F. Austin, who gave eleven leagues of land to Muldoon in return for his ministry to the colonists. Four of these leagues were located in Fayette County. The San Antonio and Aransas Pass Railroad was built through the area in 1887 and the town grew quickly around it. James Kerr established the first post office in January 1888. 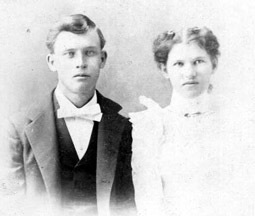 Within a decade, Muldoon boasted its own physician, general merchandise stores, churches, a barber shop, saloon, meat market, blacksmith shop, hotel, woodworking shop, lumberyard, cotton gin, railroad depot and a school. The Muldoon courthouse building is a rarity. Constructed in 1890, it is one of six justice precinct courthouses that were built in Fayette County. Over the years, it has been used as a mattress factory, canning kitchen, site for quilting bees, voting location, community meeting place and a museum. Muldoon is also known for its “Muldoon blue” sandstone. Taken from the A. B. Kerr quarry, the sandstone was used in the construction of several sites in Texas, including courthouses, a jail, churches and later in the construction of Galveston and other coastal jetties. Muldoon was once a thriving community, but declined as the railroad industry became less relevant. 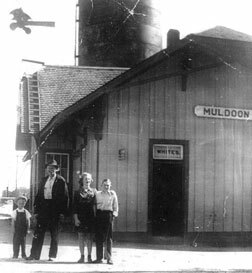 Muldoon is a railroad station on the Waco branch of the San Antonio & Aransas Pass Railroad, midway between Flatonia and West Point. In its neighborhood are the large rock quarries of Hon A. B. Kerr, from which rock was shipped to Galveston for the construction of the jetties. The surrounding country is mostly postoak. The Buckner's Creek bottom in its neighborhood is very fertile. Muldoon is a postoffice and a voting precinct of the county. It consists of one general merchandise store, conducted by Kerr Bros., one saloon, one hotel, one blacksmith shop. In Dr. H. H. Mitchell, who has been a resident physician of Muldoon since 1891, the writer found a pleasant gentleman, a physician of fine standing among the people with whom he lives. The Muldoon country was settled in the thirties. It was named after Rev. Father Miguel Muldoon, a resident Catholic priest of Mexico, to whom the Mexican government had granted four leagues of land in Fayette county. On one of these leagues the town of Muldoon is situated. It was built in 1886. The population of town and neighborhood is mostly American, with a sprinkling of Germans and Bohemians. Among the old settlers may be mentioned Alex. St. Clair, H. Leitenberg, Chas. Luck, Jesse Parker, W. P. Ivey, Jesse Blackwell, J. J. Sullivan, Herm. Loessin, Bennett Ray, J. M. Ray, H. Harkins. Where, Oh Where Did the Depot Go? One often wonders about the demise of our old historic structures  were they moved, dismantled, or did they become victims of deterioration due to time and weather? We miss seeing these old buildings in our communities, but oftentimes they are actually saved by a move, if they are fortunate enough to be recognized for their historical worth. On a recent trip to the Highland Lakes, my husband and I discovered the old Muldoon train depot that had been re-located to Kingsland on Lake LBJ. It is now part of a railroad resort called The Antlers, which is owned by Barbara and Dennis Thomas, who purchased the depot in 1999 from Erin and Kelsey Kelly of Muldoon. 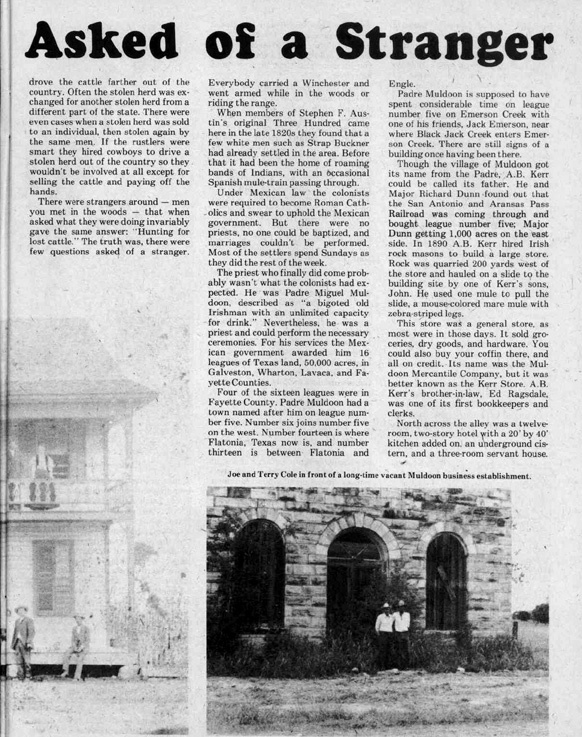 The Thomases had the building moved to their complex and then renovated it into a bed and breakfast dwelling that can accommodate as many as eight guests. It sits in the historic Kingsland railroad district along with the renovated Antlers Hotel, an old railroad hotel built in 1901 at that site, four restored cabooses and several cabins and cottages, all of which provide accommodations for overnight guests, business retreats and family outings. 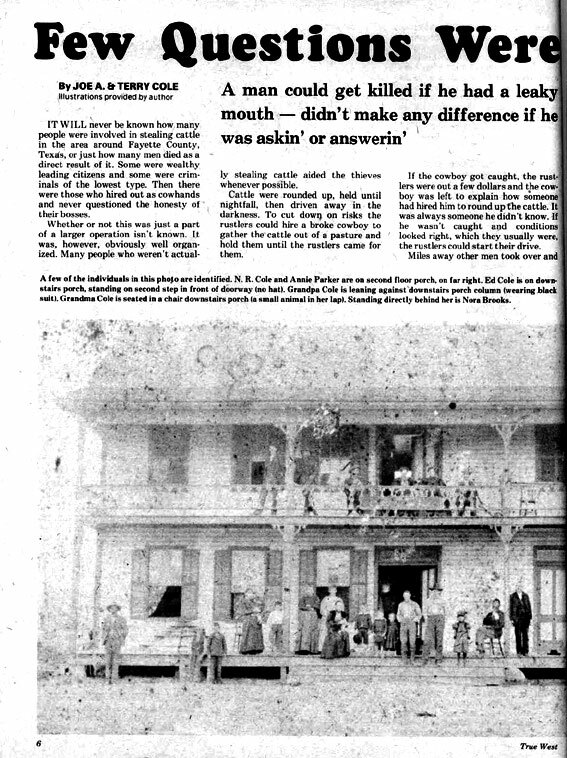 In addition, the 1909 Victorian house that was filmed in the movie, “Texas Chainsaw Massacre”, was moved in pieces from Round Rock and reassembled to be used as a restaurant on the grounds of The Antlers. Having “found” the depot, my interest was piqued enough to learn more about its history here in Fayette County, so I began the “hunt” for more information. No one seems to know the exact date that the depot was built; however, it more than likely was built circa 1886-1887 at the time the town site of Muldoon was developed on the newly-created rail line built by the San Antonio and Aransas Pass Railroad between Waco and Yoakum. Built with square nails, it had the traditional three-part construction  ticket office with waiting room, business office with bay window and back cargo area. The exterior walls were board and batten construction with wide eaves and decorative supports. The interior had walls of beaded wood and pine flooring. The general vicinity of Muldoon was already settled in the 1830s, but the railroad was instrumental in the founding of the town, which was named after Father Miguel Muldoon, the curate to Stephen F. Austin’s colony, and to whom the Mexican government had granted four leagues of land in Fayette County, numbers five, six, thirteen and fourteen. The town of Muldoon is situated on league number five. 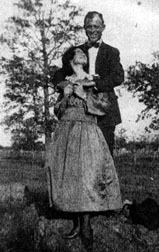 Father Muldoon supposedly spent considerable time on this league, visiting a friend near where Black Jack Creek enters Emerson Creek. There are still signs of a small rock house that Father Muldoon probably used when he visited in the area. Several residents of Muldoon still remember the mustard yellow depot, which was located across the railroad tracks from the old rock Muldoon Mercantile Store, built by A.B. Kerr. They shared their memories about the railroad and the depot that was eventually acquired by the Southern Pacific Railroad Company and its branch T&NO. In addition to steam engine freight trains that came through daily, a “Dinky” also made two daily trips through the little town, probably beginning in the early 1930s, shortly after the first electric motors were built for these small trains. 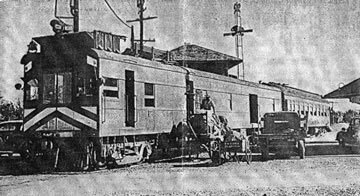 The “Dinky” was a two-sectioned train with a long engine car in front that included a motor section, as well as compartments for mail, express freight and baggage. 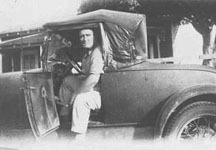 The last car was a light coach that carried passengers. Dinky No. 52 brought the mail from Waco and points north to Muldoon at noon, and Dinky No. 51 traveled from Yoakum and points south, arriving at 6 p.m. Waiting for the mail to arrive at the depot was a big event in the early days. The “Dinky” occasionally also brought iced-down wooden buckets of ice cream from Waco for eager customers during the summer months, as well as baby chickens for the farmers, and transported fresh cream from the farms around Muldoon to the “city folks”. Donald Boehnke of Muldoon remembers that he only had to pay 12 cents in the late 1940s to ride the “Dinky” from Flatonia to Muldoon after football practice when he attended Flatonia High School. 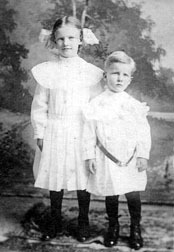 His family also occasionally used the train when roads were impassable due to inclement weather. On August 13, 1949, the “Dinky” made its last trip through Muldoon from Yoakum to Waco, in spite of requests from the local citizens to continue its service. In the late 19th century, the freight trains traveling through Muldoon began hauling sandstone from the Fayette County Rock Company that owned the quarry near Muldoon for the construction of public buildings in Central Texas. After the 1900 storm, stone was also transported to Galveston to build the seawall and jetties. 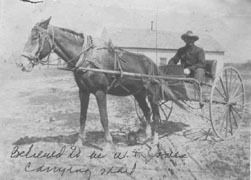 In addition to rock, the trains also transported cotton, cattle and cordwood out of the Muldoon station. The steam engines were eventually replaced by diesel engines, and then the trains no longer stopped in Muldoon, although they still frequently pass through the town, even transporting a circus now and then. Tommy Bridges was the last agent who worked at old depot. In 1961, Hurricane Carla damaged the water tower, and probably shortly thereafter, the abandoned depot was moved to a ranch south of Muldoon owned by Joe Kelly, Sr. and Charlie Rightmer, who were partners in a cattle business. They used the old depot for hay storage. After the partnership was dissolved in 1970, the ranch was divided, and the Kelly family acquired the half with the depot. 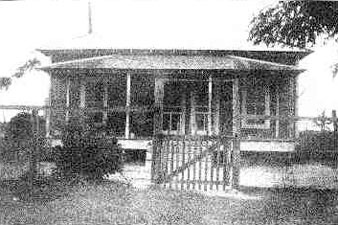 The portion of the ranch with the depot was eventually acquired by Joe Kelly, Sr.’s nephew and wife, Erin and Kelsey Kelly. The depot even provided a place for a romantic rendezvous in 1998 when Erin proposed to Kelsey inside of the ranch “hay barn”. The 120-year depot has had a colorful history that has involved two moves, the last one over 150 miles on the back roads from Muldoon to Kingsland. Now painted a dark colonial blue with brown trim, it proudly sits in a park-like setting next to unused railroad tracks with a new name  Antlers Station. It is once again serving the public, although in a much different way than it did as a depot in Muldoon, Texas. 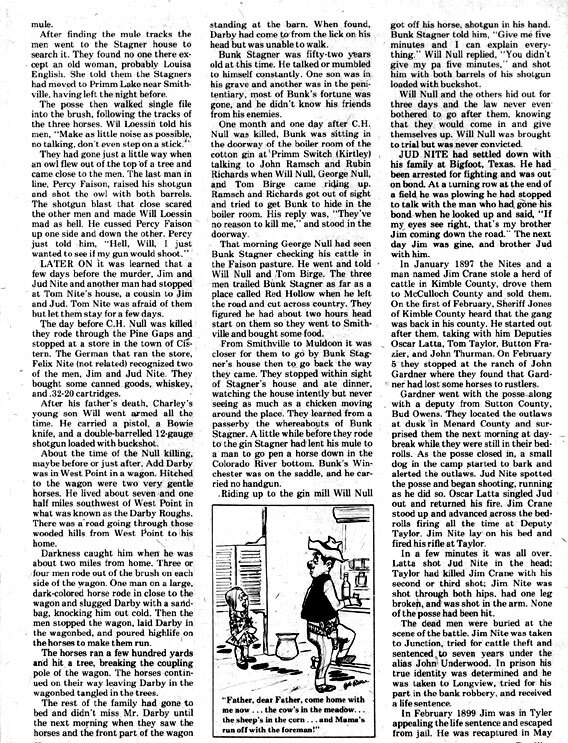 Cole, Joe & Terry, “Few Questions Were Asked of a Stranger”, True West, May-June 1980. Interviews with Donald Boehnke, Doris Forsythe, Joe Kelly, Jr., and Kelsey Kelly. 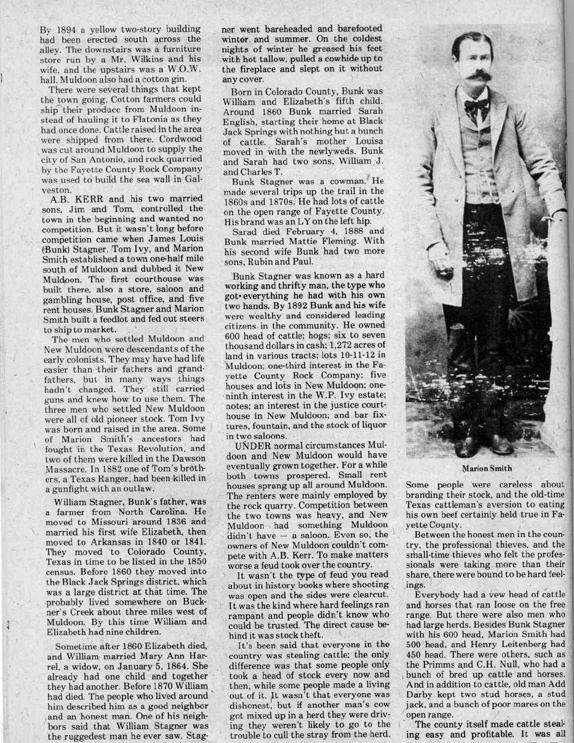 Tauch, Martha, “The Dinky”; a newspaper article with unidentified source and date. Photo. A representative of the STICKER visited the thriving little city of Muldoon last Saturday and was surprised at the volume of business transacted there. 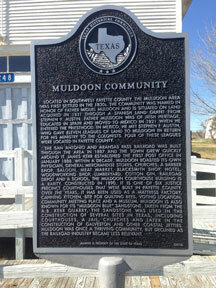 Muldoon is ten miles north of Flatonia on the S. A. & A. P. Ry., has one large general store, a blacksmith and woodwork shop, a saloon, lumberyard, hotel, cotton gine, and a flourishing school. Here also is one of the largest stone quaries in the state owned by Messrs. Kerr & Sons. The country around Muldoon is settled by some of the most thrifty as well as the best citizens of Fayette county. Mr. O. L. Lee, the jovial and good natured proprietor of the Pleasant Hour Saloon, was at his post and seemingly in the best of humor. Mr. Lee was for several years employed as a salesman in the store of Messrs. A. B. Kerr & Sons, but recently purchased the saloon. He is an excellent gentleman a thorough business man and deserves the success he is having. The large general mercantile establishment of Messrs A. B. Kerr & Sons does an immense business. They carry a complete line of everything. One would have to see their store to even imagine the amount of business done by this popular firm. During the afternoon the crowd was so dense that one could hardly walk through the store. One of the most pleasant and agreeable gentlemen it had ever been our good fortune to meet, is Dr. H. H. Mitchell, the only physician of the place. We are under many obligations to the Doctor for favors extended us during our short stay in his town. Thanks Doctor. G. W. Cole, Justice of the Peace for that precinct, and prprietor of the hotel, is a very pleasant gentleman. He has held the office he now holds for several terms and has the reputation of being one of the most impartial Judges in Fayette county. 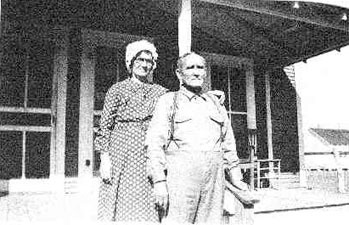 Mr. W. P. Ivy, one of the most prosperous farmers in that section, was in town that day on business and we had the pleasure of meeting him. Mr. Henry Arnold, the popular and accommodating book-keeper for Kerr & Sons, was kept quite busy with hiswork at the office. He has been with the firm for a number of years and has at all times given entire satisfaction. One thing we have not yet mentioned, and an institution of which the whole community are justly proud, is the public school. 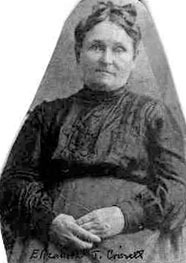 A goodly number of pupils are in attendance and under the able tutorship of Miss Neva Burns, of Flatonia, are making rapid advancement in their studies. Miss Burns as an instructor ranks with the best in the state. A very noticeable feature of the place is the seeming thrift of the colored citizens. All are in very good circumstances. Among the most prominent are Monroe Henson and Mat Howard. While there we added quite a number of names to our rapidly increasing subscription list. Photographs of mail carrier William Thomas Jones at work. 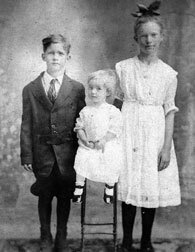 March 1917; within a year, Sally Jones lost her husband and child. See photos of Pitman Cemetery. School house is to the right. 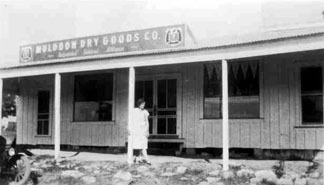 All Jones photos and Muldoon Dry Goods Store contributed by Lynn Bauch Mostella. Please contact Rox Ann Johnson if you have old photographs you would like to contribute. 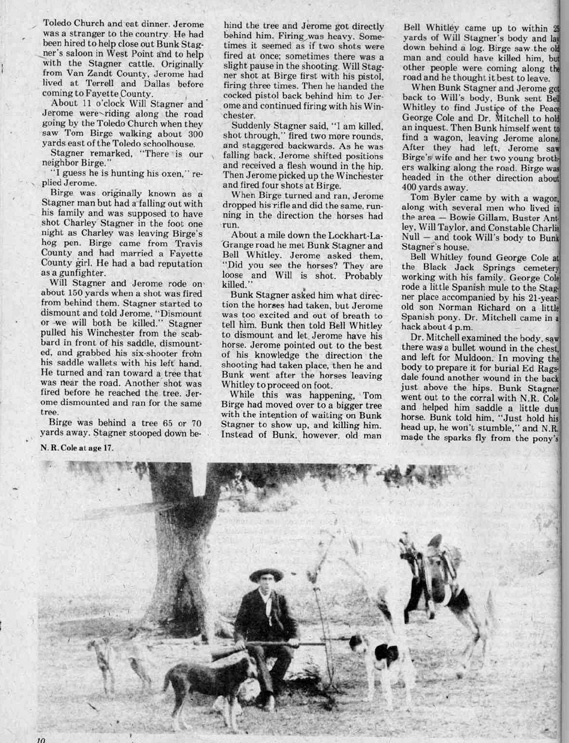 An article written by Joe and Terry Cole about cattle rustling and murder around Muldoon in the late 1800's. 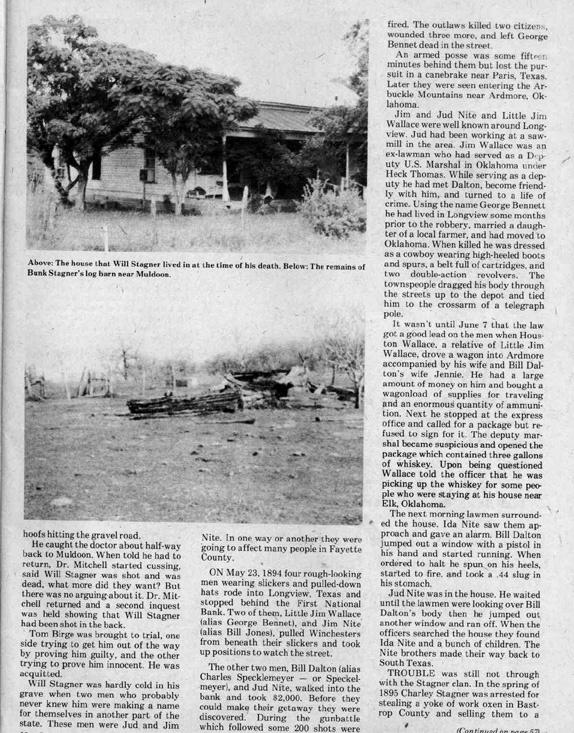 Lucretia Morales scanned the article, which appeared in True West magazineand gained permission from the publishers to post it at this site. 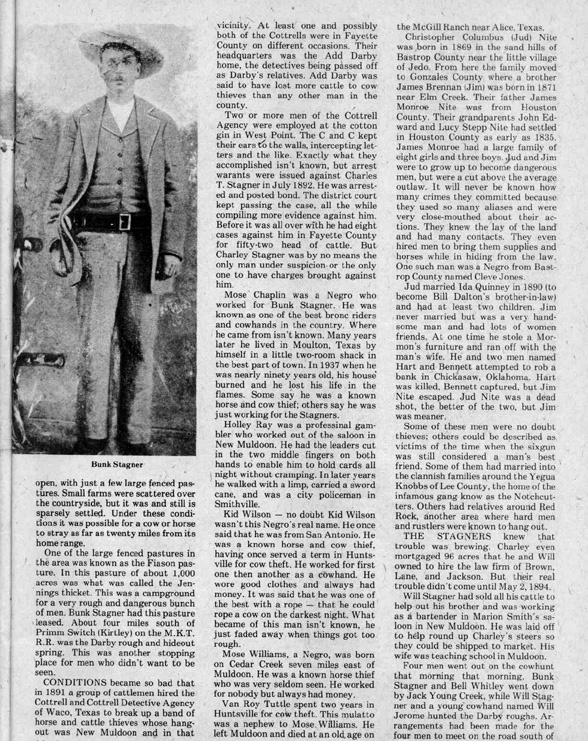 Names mentioned in the article include Antley, Bennett, Birge [Burge], Buttrell, Byler, Chaplin, Cole, Crane, Dalton, Darby, Dunn, Emerson, English, Faison, Findley, Fleming, Gillam, Gray, Harrel, Hart, Ivy, Jerome, Kerr, Lietenberg, Loessin, Mitchell, Moore, Muldoon, Nite, Null, Primm, Quincy, Ragsdale, Ramsch, Ray, Richards, Robbins, Sanders, Smith, Stagner, Taylor, Tuttle, Wallace, Whitley, Williams, and Wilson.